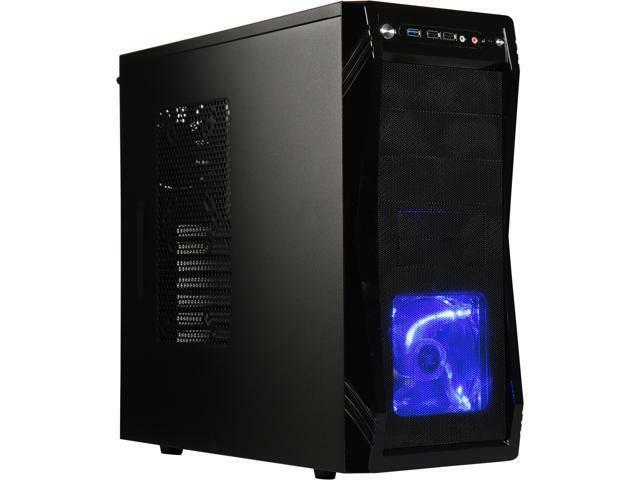 The Rosewill CHALLENGER offers all features that DIY builders value most at an affordable price point, including impressive cooling capability, multiple external 5.25” drive bays & internal 3.5” drive bays with screw-less design, convenient easy-to-access I/O panel, advanced bottom-mounted PSU design, and more. Grab it today, and build your own powerhouse. With the ability to support up to five fans (three fans preinstalled), the Rosewill CHALLENGER creates heavy duty airflow to cool down, even the most extreme gaming system. The front mesh panel, along with air vents, provides extra airflow for maximum breathability. 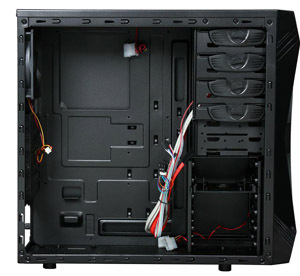 With up to five internal 3.5” drive bays and two external 3.5” drive bays, the Rosewill CHALLENGER gives DIY builders ultimate flexibility in personalizing their PC. It’s also furnished with three 5.25" external drive bays. 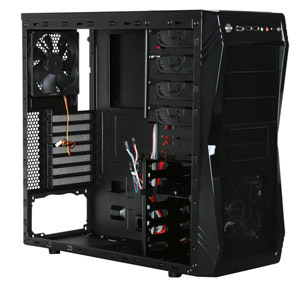 Additionally, up to seven expansion slots let you better take advantage of your motherboard’s expandability. The screw-less design for all drive bays enables easy and quick installation. The included 2.5" SSD / HDD adapter allows you to easily install two 2.5" SSD / HDDs into one 3.5" HDD slot. The top-mounted I/O panel offers one USB 3.0 port for super-fast data transfer, two USB 2.0 ports, and audio out & mic in jacks. The advanced bottom-mounted PSU design enables independent and optimized PSU cooling. The PSU's shock-proof pad reduces vibration and annoying noise. The easy-to-clean dust filters keep your computer clean and protected from dust. 17.08" x 7.48" x 18.50"
Pros: You CANNOT complain at this price point. I bought it 2.5 years ago. I have it loaded with 4 drives 1 SSD, Radeon Rx480, and a multi card reader. I had a small issue with one of the case fans buzzing against its mount once all the stuff was installed. The case got torqued a bit and a fan buzzed. Until I fixed it. If you are looking at this one then buy it. - The fans that come with it are quiet and work well. - Includes an adapter for two 2.5" SSD/HDD. - Enough room for my video card (RX 480) and CPU cooler (AMD Wraith). - Looks good. Simple and pleasing design. Cons: - Cable management is a pain. - Cramped if you have anything more than the most basic components. - The 3.5" Drive Bay placement is awkward. It faces the side of the case, instead of the motherboard. Other Thoughts: I got this on sale, so I'm satisfied with what I got for how inexpensive it was. I would probably be more annoyed with the "cons" if I had paid full price for it. Pros: Very good price on sale. Lots of fan options. The 3 fans included are pretty quiet, in my opinion. I like the tool-less drive mountings too. Cons: Would have preferred two USB 3's and one USB 2 - but I think this configuration of the Challenger is getting a little long in the tooth. I also had to rework a few things to use my Push/Pull Liquid cooler - but I'm willing to do that. Other Thoughts: I am using the Enermax Liqmax II 120s -B S liquid cooler mounted on the rear. In order to accommodate this I had to replace the premounted 140 Top fan with the 120 Rear fan, which was removed to accommodate Push-Pull Liqmax II. This gave the little extra bit of clearance in needed to avoid deforming the coolers tubing against the larger fan. I moved that 140 fan to the left Side panel - however I could not get the predrilled mounting holes in the panel to align with all 4 mounting holes of the fan. It's clearly for 1 or 2 120mm fans. As a result the 140 fan sits slightly askew when mounted. I also had to slightly enlarge the factory cutout in the left rear side panel's back edge to clear the interior Rear Liqmax fan. Other Thoughts: - Good case, especially if your computer will be under the desk/in a slot, and thus not very visible. Built for good value and function, but not for bling. Pros: Heavy steel, decent airflow, resilient overall. Cons: The metal grates over the old expansion bays in the front started to warp. Pros: Cable management is pretty good. Air flow is pretty good too. It comes with 3 fans. Two are very quiet. Cons: The case arrived with a piece of plastic rattling around in it. I didn't know what it was until I pulled the front panel off. One of the male tabs that holds the face to the rest of the case was broken off. That was the piece of plastic rattling around. If not for this, I'd probably give this case 5 eggs. The large fan exhausting air at the top is a little louder than the other two fans combined. If I disable it, the case is very very quiet with the other two fans still running. So this is only a minor con as it isn't THAT loud and if someone thinks it is too loud, it can be disabled and the case should still be well ventilated. 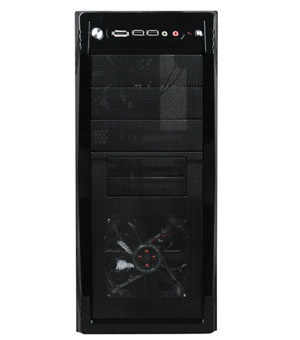 Pros: I've had this case for quite a few years now when I migrated an Asus P8Z77-V in to it. My son is now using it for his 1st build; a Ryzen 7 Gen 2. Every penny counts and a free case from good old Dad along with the joy off building it together makes it an even better value for me. 1.) Decent case for basic builds. It's the little extra esthetic detail that separates it for other cases. 2.) I like the metal power & reset buttons. 3.) The blue LED fan shines nicely and wasn't loud while reasonably cooling the hard drives. 4.) Fan mounts on the side panel came in handy when I was running two GTX 750ti's in SLI. Man did they get hot without those fans! 5.) The gloss black face plate wasn't too annoying and again worked for the esthetics the way it angles in at the center. Cons: 1.) The cutout under the motherboard needs to be bigger. I had to bend out a little on one corner of it to slip in the motherboards back plate when upgrading to a Corsair H120 AIO. 3.) The plastic feet on the case were the first to go; I used some I got from MNPCtech case Mod which gave more area for air. 4.) The PSU dust filter grill is way to small of a cover that is a PITA to get at and use. Fairly easy to install components. Front control panel poorly designed!!!!! USB ports loose, and quit working/locked up PC. Contacted Rosewill and they sent another. Second one had screw stripped, had to Frankenstein it and old one (put circuit board in old unit). Contacted Rosewill AGAIN and no response. Going with a different brand for all of my builds. We are really sorry about the screw stripped issue. You could contact us to claim the warranty with your order invoice, we will further check if any part can be sent to you at our cost. Once again, sorry for any trouble.